Designed for the planet. Great for you. Cleaning supplies for a sparkling home. If you're starting out on your own or moving into a new house or apartment, you know the basic items you need to make your home a home, such as living room couches and chairs, a dining table, some kitchen appliances, a bed and a dresser. However, it's the small things items like cleansers, detergents and trash bags that keep your home functioning and looking like the place you want it to be. 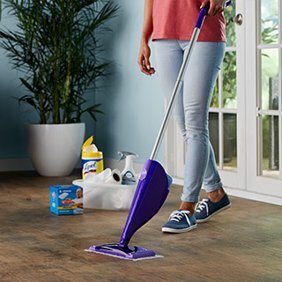 Stock your home with all the supplies you need to keep it clean and spiffy, and save money at the same time thanks to our low prices, every day, on everything. Here's everything you need to stock your cleaning cupboard. All-purpose cleaners These are cleaners you can use on multiple surfaces, such as stainless steel or glass; they're good for cleaning items in the kitchen, bathroom and living room. Cleaning tools These are the items that assist you in cleaning, like scrubbing sponges, mops, brooms and dusting tools. Floor and surface cleaners Keeping your floors clean, whether they're carpeted, tile, wood or linoleum, requires some work. You can do this by spot cleaning with spray cleaners and sponges or rags, dry or wet sweeping with pads, or using a vacuum cleaner or steam cleaner. Pet stain and odor cleaners Sometimes, accidents occur with your pets, but you can make everything as good as new with carpet cleaners and stain and odor removers. Eliminate smells with powdered or liquid deodorizers. Glass cleaners For all the glass tabletops, mirrors and other surfaces in your home, glass cleaners keep them clean and streak-free. Cleaners come in spray liquid, spray foam and wipe forms. Liquid detergent There are many brands of laundry detergents, including ones that are scented or scent-free, dye-free and those meant for high-efficiency machines. Scent-free and dye-free types are friendlier to those with sensitive skin or allergies. 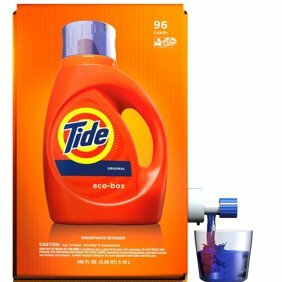 The bottles can clean from 25 to more than 100 loads of laundry, so choosing a larger box or bottle is usually more economical. Powder detergent Powder detergents come in boxes or pails; the larger-size containers comes with a scoop to measure the amount of detergent you use. These clean from 40 loads to more than 120 loads. Pacs and tablets Detergent pacs and tablets are a convenient way to clean clothes. The tablets dissolve in the water in the washing machine, while the pacs, which hold laundry detergent inside them, dissolve and release liquid detergent into the wash. Pacs and tablets come in resealable bags or tubs to keep moisture out. Bleach Bleach comes in two forms: chlorine and color-safe bleach. Bleach comes in liquid or crystal form and pacs. Stain removers also come in a spray that you apply directly to a stain before allowing it to set up. Color boosters help clothes retain their color longer. Dryer sheets and fabric softeners Dryer sheets remove static cling and deliver fabric softener to clothes while they're drying. Fabric softeners are either in liquid or pac form and work while clothes are washing. These make clothing, towels and other items fluffier and softer. Dish soap Use this type of soap for washing dishes by hand. It's also good for washing your hands or using as soap for washing household items. These aren't meant for use in a dishwasher because they form too many bubbles. Dishwasher detergent This cleaner is specifically designed for use in a dishwasher and comes in powder, liquid or pac form. Plastic wrap and aluminum foil Use plastic wrap for covering food for storage in the refrigerator or freezer. Aluminum foil serves the same purpose but is also good for cooking, such as lining baking sheets or wrapping vegetables for roasting. Trash bags Kitchen trash bags are generally white or black and hold 13 gallons of household garbage. Some are scented, but many are unscented. Trash bags are available in boxes of 24 or more and close with self-contained ties, drawstrings or twist ties. Paper towels These essentials are disposable paper sheets you can use to clean with or drain fried foods. They come in individual rolls or packs of two or more. Paper towels come with at least 60 sheets per roll, and some brands feature a select-a-size option that lets you tear off as much as you need. Toilet paper Bathroom tissue is a necessity in every bathroom. Rolls are scented or unscented and are available in single rolls or packs of four or more. Sheets per roll range from 165 to more than 1,000 and come in varying thicknesses. Drain and septic care Drains sometimes get clogged, so you may need to use a clog remover to keep your toilets and kitchen or bathroom sinks clear. These are available in powder, liquid, gel or foam. Facial tissue These are handy to have in the bedroom, bathroom and even your vehicle. They're sold in boxes or small pocket packages. Household batteries Many of your electronic devices, especially portable devices, need batteries to operate. The most common ones are AA, AAA, C and D batteries, but there are smaller batteries and flat ones as well. Light bulbs There are many different light bulbs available in many different wattages. These can be single-use bulbs or three-way bulbs.